What are encapsulated pocket springs? What are Foam Encapsulated Pocket Springs (FEPs) is a question we get asked all the time. It’s something that throws up confusion in customers on how FEPs differ from coil or pocket springs. This article should help explain the difference and clear up any confusion. So what are the benefits of having an encapsulated pocket sprung unit? The first thing to note is that the labour costs of producing this construction is far higher and will be reflected in the cost/retail price. 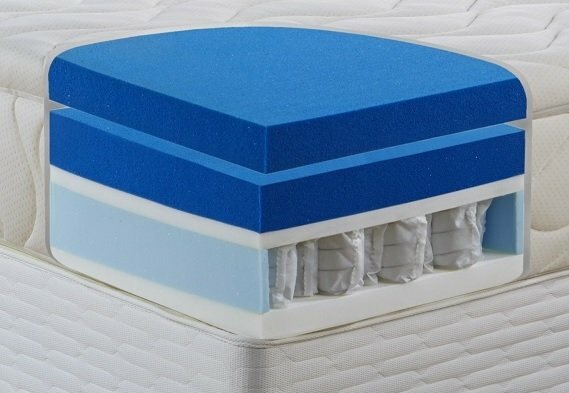 Having a high-density foam perimeter inside the mattress goes a long way to aid full edge to edge support. By their very nature pocket springs are flexible and so some people may find sleeping on the edge of [a traditional PS mattress] gives them a ‘rolling off’ sensation. This is particularly true if you use a pocket sprung mattress for the first time after being used to an open coil system. Traditional top end pocket sprung mattresses use hand side stitching as edge support, many of the midranges don’t use anything. People who are looking to replace the mattress on their electric adjustable beds may also find this type of construction more beneficial than the usual slab of foam that is usually offered. There are none as such although the retail prices of some models are excessively overpriced for what you are getting. The added weight can be a factor that should be taken into account. The depth of the finished mattress is usually greater than a traditional unit a visual sign of the supposed quality and worth. Heat retention may also be apparent but there is no hard and fast data (openly available) to support this but logically it must be somewhat heat retentive. Nine times out of ten it will be used as a non-turn, one-sided mattress. There are arguments that say the foam in a FEPS unit is taking the place of actual springs (on the perimeter) and so it is a cost saving to the manufacturer. Not really, the extra labour used to produce a FEPS unit is more of a cost consideration to the manufacturer than a few extra springs. Another argument says that because the foam is used on the entire perimeter it decreases air ventilation. Probably, but as with most things, this is pure speculation without any available hard data. This is so trivial a potential concern it’s not worth worrying about as all foam is naturally self-ventilating/aerating. In short, a foam encapsulated pocket sprung unit is an ‘alternative’ to a traditional pocket sprung unit. With a FEPS unit, a manufacturer can add a variety of primary layers and indeed additional springs to suit most budgets and markets – all being based on the same internal unit. The pocket springs themselves are generally the same as traditional units, a few exceptions are mattresses made specifically to be vac packed (smaller) or for more economical models where the spring height and turns are reduced to service a potential market. How do I compare springs? The spring count is often used by manufacturers to claim their FEPS are better than others. 1500 pocket springs are better than 1000 isnt it? Not necessarily. It all depends on the size, gauge and style of spring used. A mattress with more springs can, in fact, be softer or less stable than one with fewer pocket springs. The bottom line is the number itself does not dictate the quality, you need much more information. There has been a number of innovations in the last few years around FEPS and there is even a spring made from foam out on the market. These mattresses have developed either springs or coils out of foam to be used instead of traditional pocket springs. Many people often contact us and ask ‘What is an octaspring‘ followed by ‘Do you sell Octasprings?’. Octasprings are probably the most commercially known of the foam springs and have been out for a few years. Their advertising states they are cooler than solid memory foam as there are air gaps between the coils which help reduce the temperature. Our view is that this may be a clear benefit but given the price of Octasprings you may be better off with a traditional pocket sprung FEP or traditional pocket sprung mattress if heat is an issue. Memory foam will always be warmer than natural materials so even making springs out of foam does not remove their heat retentive nature. The newness of these products also means there are no long-term testimonials of the products shelf life or duration so it’s hard to comment on this. 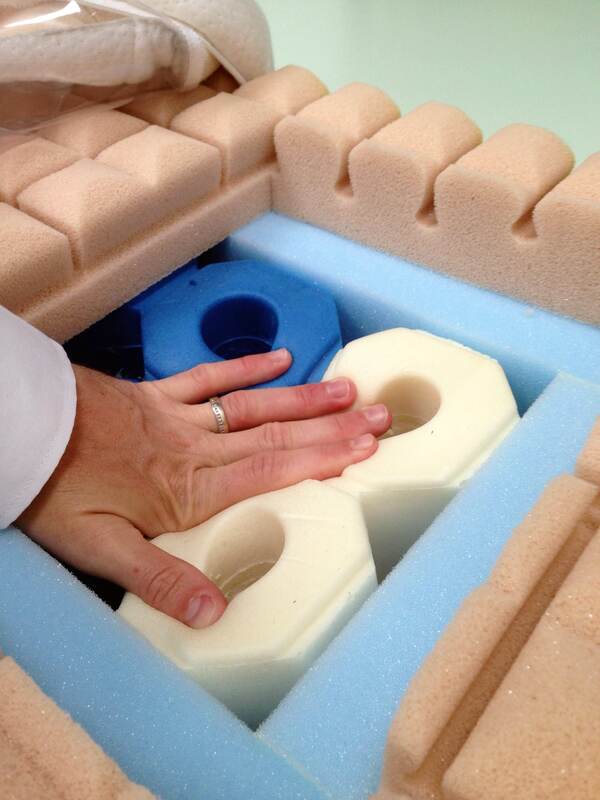 We don’t use Octasprings as they are a proprietary foam spring used by Dormeo only in their mattresses. Here at John Ryan, we are quite old-fashioned that we only use tried and tested materials so we use high-quality FEPs, not foam springs. Springs made from foam have been around long before Octasprings though and Kay Metzler, a UK-based foam manufacturer. Primarily these foam spring mattresses were marketed and sold in Germany and Europe. They never really took off in the UK, probably due to the high cost and therefore retail price. We have some of their early German prototype models which we have examined. 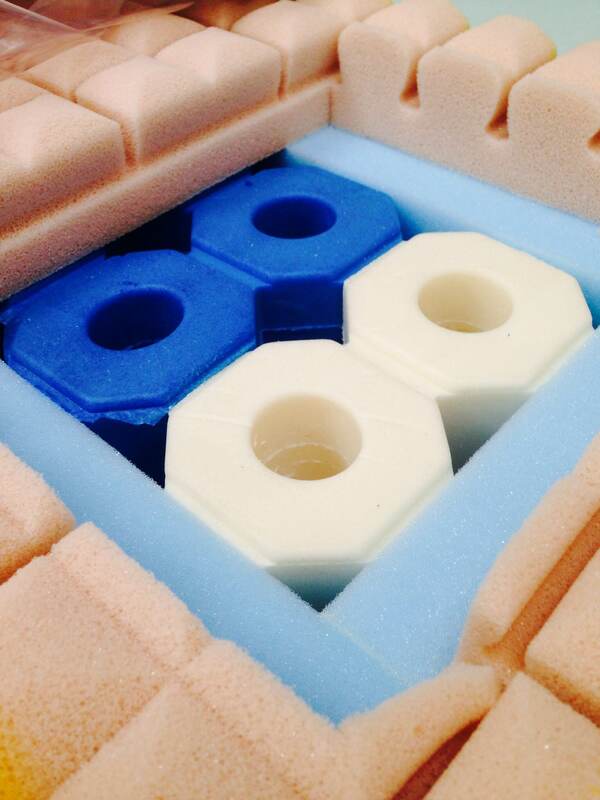 Different densities of foam can be used to create different tensions of foam springs which are quite interesting. This has been the practice for traditional pocket springs since day one. 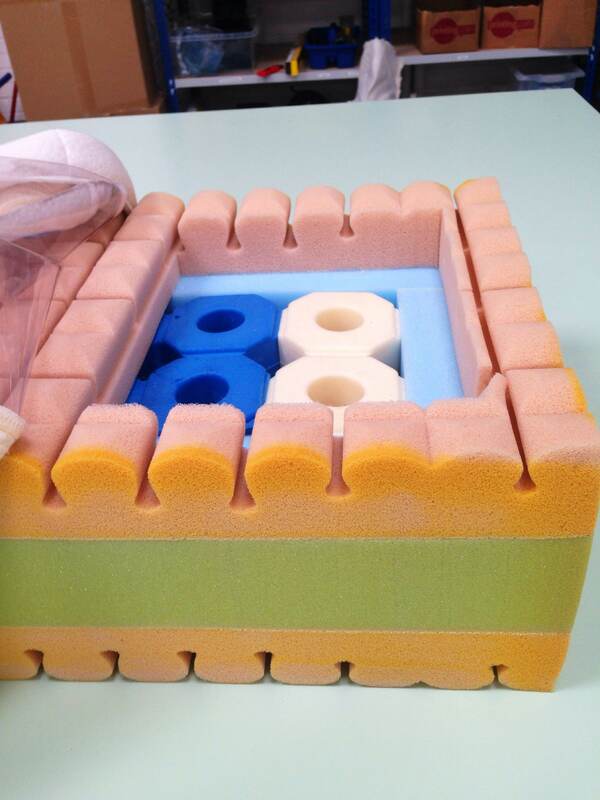 The castellated foam on top would be the comfort layer that covers the foam springs giving a softer top layer. Here is a cutaway of the foam springs Kay Metzler developed with replacing traditional foam springs. An example of how the foam springs react under pressure, these springs are then covered with a top layer of softer foam, as the comfort layer, the cutaway is there for demonstrative purposes only. They are of a high quality but given the high cost, we are not convinced they offer any benefit over and above a traditional pocket spring, more innovation than necessity. Given that metal springs have been used for a century now for a huge range of uses, we are not sure why the use of foam now exceeds a high-quality steel forged spring! This again may be subjective and it is upto the consumer to decide whether the overall comfort of a foam spring is more suitable that a traditional pocket spring. Heat and degrading of memory foam: The very slight downside of possible heat retention can be combatted with lighter bedding but the bonus of added longevity and comfort may make it worthwhile. When memory foam (as opposed to latex) is used as the primary layer then careful thought has to be applied to what you are paying for the mattress. Memory foam does degrade well within five years (despite what a salesman will tell you) causing an uncomfortable and permanent dip and therefore the spring unit will far outstrip the usable life of the memory foam. Don’t think for one moment that because the retail prices of many FEPs units are rather high you will be getting a top quality mattress. These should be seen as a mid-range construction method and always do your comparisons with traditional pocket sprung mattresses with similar primary layers. Please get in touch with us on 0161 437 4419 to help you further with this subject matter or for a mattress recommendation. How Long Should A Natural Fibre Mattress Last? The Mattress MOT: Does Yours Pass The Test? Why Do Natural Fibre Mattresses Cost More? What Makes Bamboo Such a Great Natural Fibre For Luxury Mattresses?